I got back from my USA trip to find a few packages waiting for me. One was from Knitcircus Magazine -- I made third place in their Health and Love Scarf Design contest with my 'Hugs & Stitches' design concept. My package came sweetly wrapped in tissue paper. What did I get? 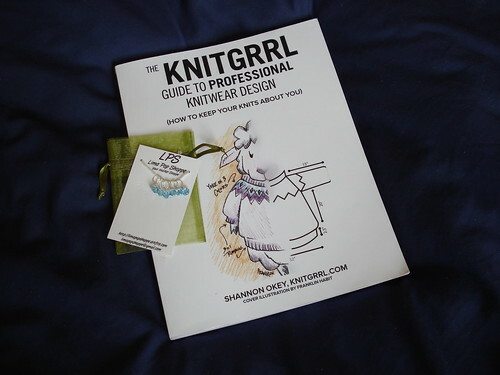 A set of stitch markers from Lima Pop Shoppe, and a signed copy of The Knitgrrl Guide to Professional Knitwear Design. I actually already have the ebook, but it is nice to have a hard copy! And I know I'll get use out of the stitch markers. Big thanks to the team at Knitcircus! I was thrilled to be selected.